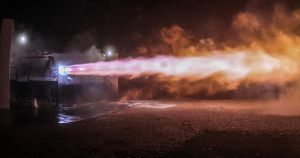 SpaceX’s next generation Raptor engine roared into action at its test site in McGregor, Texas, in a video CEO Elon Musk posted on Twitter Sunday night. This particular iteration of SpaceX’s Raptor engine will be used to launch the space company’s gigantic stainless steel Starship into space — and eventually to the Moon and beyond. The new engine design will be responsible for getting the Starship spacecraft off the launch pad and boost it through the vacuum space. That’s a surprising departure: so far, conventional rocket designs have used multiple stages, jettisoning fuel tanks and boosters as they ascend. It will also use methane as fuel — a choice SpaceX says will improve performance. And given that it’s an abundant resource on Mars, it could provide a convenient way back home. There will also be two versions of the Raptor engine: one specialized for sea level and one for vacuum optimized thrust. A total of seven Raptor engines will blast off in unison to launch the final Starship design. The next steps for the new engine will be so-called “hop” tests at relatively low altitudes. If all goes well, Starship could start making its way on a cargo mission to Mars as soon as 2022. But budget cuts, severe weather, and mounting costs could end up delaying that trip significantly.